My grandparents have always been a huge source of inspiration for me. My grandfather was the king of taking basically nothing and making something wonderful out of it; he was our go-to as kids when we needed something fixed, built, or sewn. Grandma and Grandpa knew the meaning of family and how to make a house a home. I'll always remember how warm their floors felt in the winter on my bare feet. The candy dish on the piano that I visited the moment I stepped through the door. The smell of that house on Lilly Chapel has stayed with me to this day. For a kid whose house was ever-changing that little brick, Cape-Cod felt more like home to me than any place I'd known. And so with each home I enter, whether I'm helping a client develop their own sense of style for their new home or staging an old, beloved home to sell so they can move to that next place on their journey, I take my Grandparents and the love that they shared with me. We have been working on this project for months and have been so pumped to share the final results with you all! First, can I just talk about how lovely my clients are? They were especially kind, encouraging, and a serious joy to work with. We had a blast pulling this room together! Susie and Mark came to us wanting a revamp of their master bedroom furnishings, new paint color, and decorative details in the room. They wanted a new bed and had a design challenge with a very short, long window directly above the only space in the room that we could place the bed that would make sense. Luckily, their space was already amazing, with a soaring ceiling, and beautiful natural light so pulling this one together wasn't too hard. Bonus: they have amazing taste and style. Quick note: one of these days I will get really good at taking "before" pictures. This was obviously not one of those days. I have one pic (below) from about midway through with the new bed already in. You get the idea. See? Totally weird window. Why do you do this to us, builders? WHY? This bed. THIS BED. I am just obsessed. We knew we wanted something with a higher headboard to draw the eye up, but we still liked the idea of a platform bed of sorts. The brass geometric inlay on the headboard makes it extra special and I think brass plays nicely with that wall color. Pay special attention to the legs on the bed: They are so freaking cool. 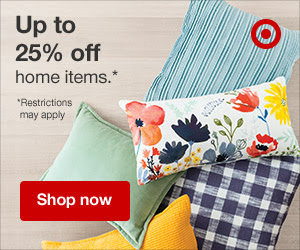 Well done, West Elm and Roar & Rabbit! 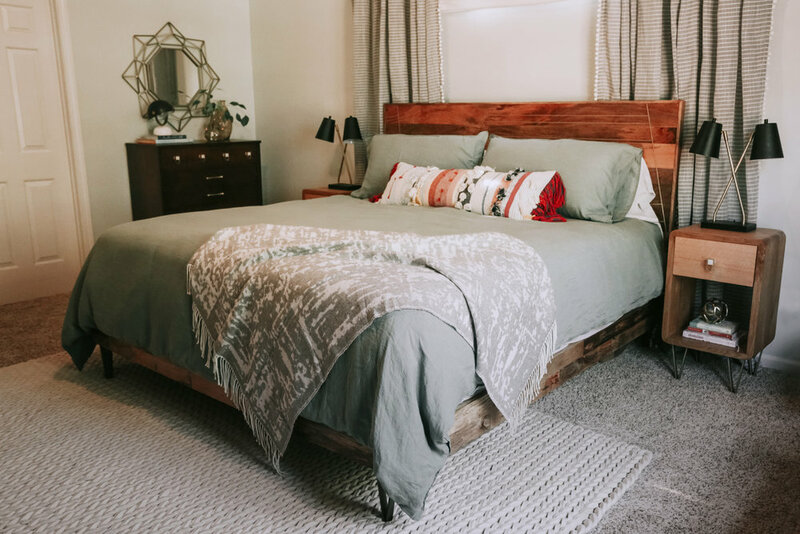 The bed is crafted from mango wood and the tone and wood grain are just stunning and add a lot of texture and interest so we wanted to go minimal on the bedding. We chose this beautiful washed linen duvet set from H&M and that lumbar pillow from Anthropologie brought in the right texture and pops of color we needed. Swoon. We went with these simple, sheer grey curtains with a white stripe and white pom trim from Target since they are behind the bed a bit and there is enough texture in the room already. The client didn't want a rug in the room because they have carpet, so we borrowed this adorable Brady rug from Crate and Barrel (it is no longer available) from a good friend for the shoot. I think it just needed some texture for the photographs but in real life the room is beautiful without the rug. Although, I think that rug has talked Susie and Mark into getting their own for that room now. Sorry, guys. Once we picked out the bed, we tossed around the idea of matching bedside tables from West Elm, but they were a tad big for the room and we wanted something that coordinated rather than matchy-matchy. We decided to go with custom pieces by Pin2Porch/Casey Edgar, based out of Indianapolis. We designed these together with the client and builder and were inspired by the amazing legs on the bed, and the shape of these tables by Made Goods. The bedside tables turned out better than I could have dreamed, honestly. They are white oak, and STUNNING. We finished them with these amazing pulls from Anthro. Speaking of Anthro. The indigo dresser, folks. She is a beaut. 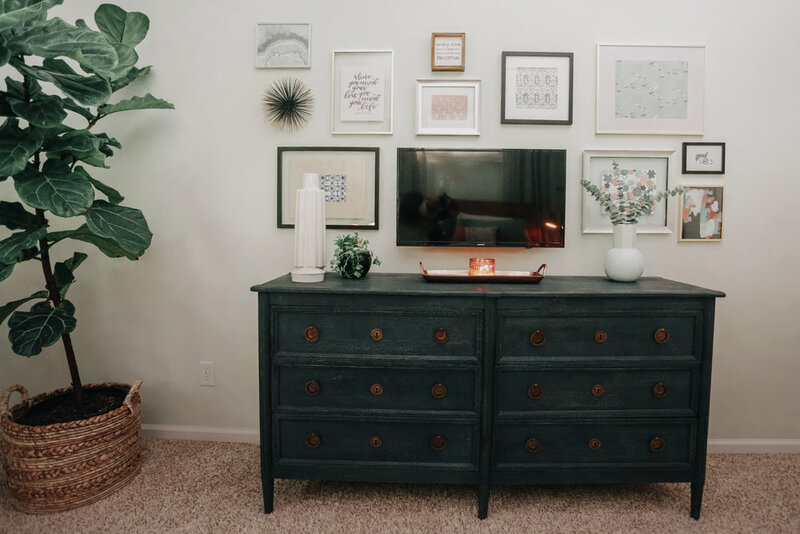 In pictures, the dresser looks a bit dark, which makes my heart a little sad because I just want you to see how gorgeous the inky, deep-blue-green color is and how lovely it is with the brass pulls and the wall color (sigh). Anywho. I think the dresser turned out to be Susie's favorite piece (me too, Susie!). How do people feel about hanging a television over an amazing piece of furniture in a master bedroom? I am guessing there are some strong opinions out there. I get it; electronics are generally ugly and not my most favorite design accessory/obstacle. Anyhow, if you're a parent, a television in the bedroom is kinda of like a television in a bedroom when you are a teenager. LOL. But I'm serious. Need to hide away from all the dirty dishes (your parents) you don't want to look at while enjoying Madmen? Master TV. Feel like you might want to softly sob yourself to sleep after every episode of This Is Us? MASTER TV. So we hung a gallery wall around it, hid the cords and voila! It is still a t.v. but less noticeable and this is real life where we all need a television, when we need a television away from our children and adulting responsibilities, okay?! I can't take much credit for all the adorable/cool/cute things hanging in those frames-this part really was a joint effort in the procuring of said things as well as the hanging. Go team! A few of my favorite pieces that should get special mention are the mid-century bench in front of the windows and the Minted print in the corner. The bench was kind of a find of my lifetime, I think. I bought it off of a lady on this swaperoo group I am a member of on Facebook (I'll tell you all about this secret society of amazing finds and lovely people someday). It was painted with an interesting design on the top and greige legs and I used it for staging off and on because it was big and worked in a pinch. We knew we needed a long bench and we put in a good fight for a velvet pink upholstered one, but lost (more sigh). In the long run, I am glad we lost that battle because this bench is perfect-the size, the tone of the wood, and the style. JACKPOT! Susie's dad stripped and sanded it down to the original wood and to our surprise the wood was in near perfect condition under all that paint. Winner-winner. I hope you love this room and the reveal as much as I do. I am kind of freaking out as I type this after 11 PM because this is my first big, true reveal that has been a long while in the making. At the end of the day, I am just thankful for a job I love and for clients who trust me with their homes. We've already started working on Susie's home office and obviously, I am just pee-my-pants excited about it already. We will have some sneak peeks for that soon! For now, sleeeep. Our homes tell a story. When we purchased our very first home in 2015, the whole process was way more complicated and terrifying than I ever imagined. Every commercial on television makes it seem so easy, and they were all lies! Luckily, we had a lot of help along the way-from amazing friends who let us live in their homes and cared for our children (and dog!) for the month we were in between our rental and the new place, to family who gifted us money to pay for a down payment, furnish the new place, and helped us move in. We would not have survived that transition, and we quite literally would not be living in our home, if it were not for the enormous amount of love and support our family and friends showed us. And don't even get me started on our amazing realtor or I will just shed real tears on this keyboard. When we were able to finally move in I began thinking about paint colors and decor for our house, and I knew right away that I wanted our home to tell the story of who we are and be a reminder of where we have come from. An homage of sorts, to our loved ones, to what we hold most dear, and to our little family. As soon as you walk in our front door, our entry walls are pink (Pink Ground by Farrow and Ball, by the way-SWOON). Listen, if I am super honest, pink is not on my list of favorite colors, but this pink is beautiful and light and dusty and it was my husbands' late grandmother's favorite color and it reminds me of my mom. My favorite picture of Grandma Evelyn, holding our sweet son Leo when he was oh, so tiny hangs in the foyer. Our favorite family pictures will hopefully line the stairwell someday (hello, long list of projects). But that foyer? It is dedicated to Grandma and the legacy of the matriarch of our family. I have had the honor of being a part of my husband's family for over a decade now and from the minute I walked in Grandma's door to the very last time I was in that sweet house after she passed I always felt at home. I mean, that woman knew the definition of hospitality, and would offer it to family and stranger alike. But you know what? I truly believe that she also put her heart and soul into making their home that Grandpa built with his own two hands a testament to who they were, what they held dear, and a warm comfy place for all who entered. I am hopeful that our home, and our family, can be that warm, safe space that knows no stranger and where you feel so welcome that you'll be raiding our shelves for treats and the fridge for caffeine–free Cokes without permission. What do your walls say? What kind of story does your home tell about you and your family? I would love to hear about what your home says about your family in the comments below!